Para los grupos las tarifas son no reembolsables por cancelacion. 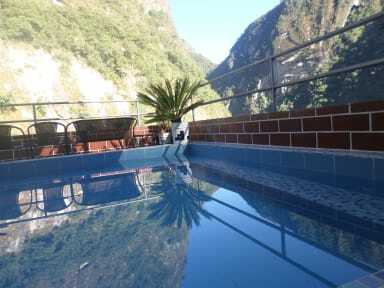 Vista Machupicchu is a cosy hotel located in the heart of Aguas Calientes, Machu Picchu. Vista Machupicchu has a terrace with beautiful panoramic views of the mountains. A daily breakfast is included. Services offered at the hotel include a 24-hour front desk, concierge service, luggage storage and Free Wi-Fi access is available. If you have need any further information about the area, do not hesitate to contact the property. Vista Machupicchu is well-located in the heart of Aguas Calientes, Machu Picchu. Vista Machu Picchu is 100 metres from the Train Station, 700 metres from Machu Picchu Hot Spring and around 3 km from Huayna Picchu. 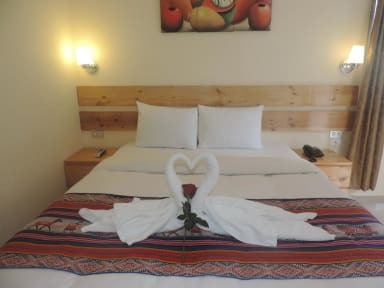 The hotel offers cosy and spacious double (or twin) and triple rooms, all with private bathroom. The rooms are fitted with a flat-screen TV with cable channels. Some rooms have views of the river. Vista Machu Picchu features free Wi-Fi throughout the property. Room service is available upon request. For any further information, please do not hesitate to contact the property. Check-out time is 09 am. For any further information, please do not hesitate to contact the property. Payment types accepted at this property: only cash accepted. $ 10.00 Not taxes included.